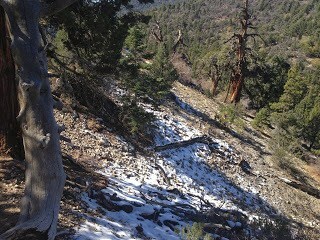 Panoramic View from the Hiking Trail’s Edge. 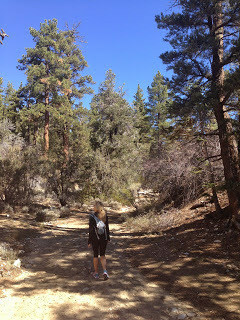 This Big Bear hike was absolutely beautiful! We did this hike after a recent rainstorm in fall, and the lake views and forest scenery were impeccable. 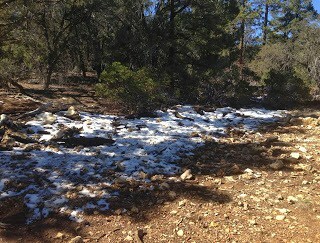 There were even small patches of snow along the way! Cougar Crest Trail to Bertha Peak hike starts about 2 miles east of Fawnskin in Big Bear, where you’ll see the trailhead located on the left-hand side of Highway 38. 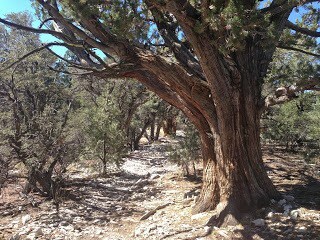 Throughout the 6+ mile hike, you’ll find a steady incline, and at some points, a steep grade to climb. 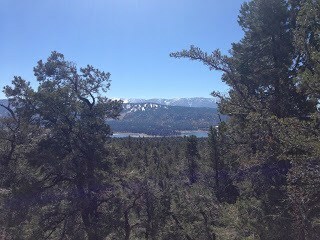 From the parking lot, the trail climbs through a pine forest, where you’ll keep left and climb a ridge with views of Big Bear Lake on your left. Continue onto the Pacific Crest Trail and head east, where the grade will mellow out for a bit before hitting some steep inclines. Look for the trail split of Pacific Crest and Berta Peak, make a right when the trail splits if you are going uphill (see trail sign pictures below). 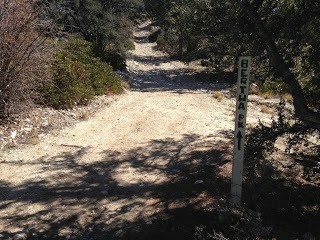 Once you reach the summit of Bertha’s Peak, stay left on the dirt road and continue to climb to the top. 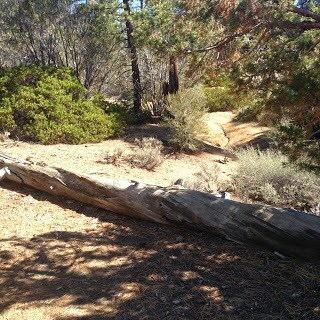 Once you arrive, you’ll find 360 degree views of the San Bernardino Mountains and Big Bear Lake. Warning: The high elevation may cause you some shortness of breath. Bring plenty of water and snacks to enjoy at the top of Bertha’s Peak! 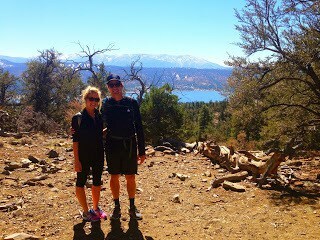 We enjoyed this hike for its stunning views and its great workout. The fall air was crisp, the mountain sky was clear, and the steady mountain grade offered us a challenge. The hike was easy-to-get-to and not too crowded. 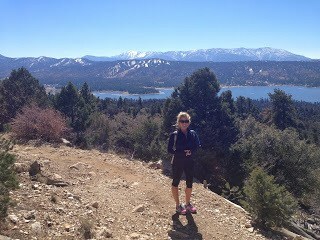 This trail offered stunning views of Big Bear Lake, which can only be enjoyed from a high vantage point. CA-91 E becomes I-215 N.
Merge onto I-10 E via EXIT 40A toward Redlands. Merge onto CA-210 W via EXIT 77B toward CA-330/Highland. Merge onto CA-330 N via EXIT 81 toward Mtn Resorts. Take CA-330 N to 38 East. At Big Bear Dam, continue on 38 (left) along the north side of the lake. The signed trail head parking lot is on the left, 2.5 miles east of the town of Fawnskin. A National Forest Service adventure pass ($5 for a day or $30 for the year) is required. A parking area is located on the left-hand side of highway 38. 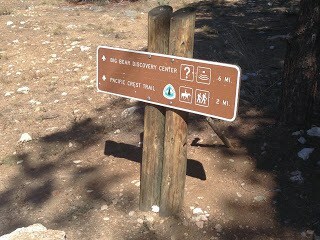 You’ll see the trailhead and a parking lot. If the parking lot is full, park alongside the highway. A Forest Adventure Pass is required for parking. Passes are $5.00/day. Early Fall/Late Spring/Early Summer: We recommend doing the Cougar Crest Trail to Bertha’s Peak during the spring, summer, and fall seasons. Because snow is common in the winter, be prepared with the appropriate shoes and warm clothing if you plan on going from November – April. Also, the summer months can also get into the high 80’s and 90’s, so be prepared for that as well. Hiker enjoying the start of the Cougar Crest trail. Various trees and vegetation border the trail. Small patches of snow! A hiker’s delight in early Fall. Section of the trail where Cougar Crest becomes Bertha Peak Trail. 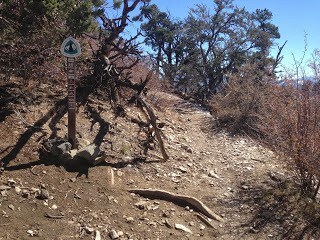 If you are hiking uphill, stay right. Hikers enjoying views from the trail. Yes, dogs are permitted on leashes. Have you hiked Bertha Peak? Share your experience with a comment below! Advantageously, the write-up is in reality the freshest topic on this associated concern. I fit in together with your conclusions and will eagerly appear forward to your upcoming updates. Just saying thanks is not going to just be adequate, for the exceptional clarity in your writing. I will straight grab your rss feed to stay informed of any updates.